Selkirk College biology instructor Dr. Delia Roberts has put together a program aimed at cutting down the stress and strain put on ski industry employees during the winter months. The Fit for Snow program was developed after extensive research and has already produced proven results. Those who embrace the thrills of the outdoors in winter rely upon snowsport resort workers to keep the terrain in top shape, teach proper techniques, get them safely to the top of the runs and swoop in when things go awry. With that type of responsibility, it’s essential snowcat operators, ski school instructors, liftees and patrollers are up the challenge. Through the Fit for Snow program, Selkirk College biology instructor Dr. Delia Roberts helps provide the tools to ensure snowsport resort workers overcome the rigours of the winter season. 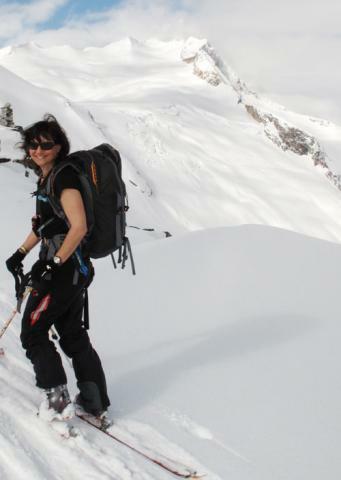 Selkirk College biology instructor practices what she preaches by living a healthy outdoor lifestyle. 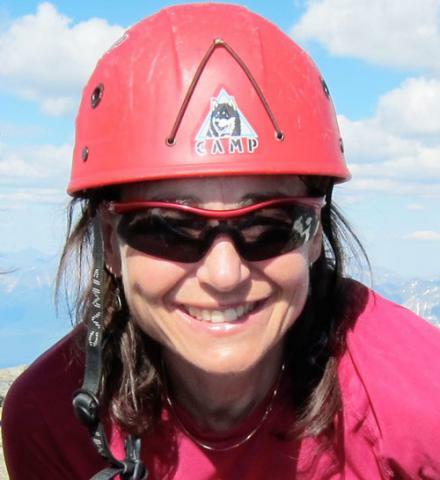 The Canada West Ski Association approached Roberts in 2010, asking her to put together a program specific to the industry based on her research and applied methods for tree planters (Fit to Plant) and mountain guides. The specific aim was to characterize the factors that contribute to injuries in ski patrols, lift operators and snowsport instructors—including poor control of joint stability, poor dietary practices, inattention and fatigue. With assistance from a WorkSafe BC grant, Roberts embarked on a study that included 25 patrol staff, 25 lift operators and 25 instructors at five resorts in Western Canada—Whitewater, Red Mountain, Sun Peaks, Sunshine and Lake Louise—that volunteered to participate. The extensive research included pre-season assessments, daily monitoring of heart rate during the season, detailed recording of food and drink consumption, and a host of other tests. Roberts has spent many years studying ways the human body can better perform under stressful situations. She started her journey as an exercise physiologist at the University of Calgary where she first graduated with a Bachelor of Science in biochemistry. From there she went to a Master’s Degree in exercise biochemistry and a PhD in medical science. Working under the mentorship of renowned exercise physiologist Dr. David Smith at the University of Calgary, Roberts had the opportunity to be part of the staff working at the High Performance Laboratory which helped train Olympic athletes. Between 1984 and 1998, Roberts worked with many Olympians including medalists Michelle Cameron and Carolyn Waldo (synchronized swimming), Mark Tewksbury (swimming), and long track speed skaters Catriona Le May Doan, Susan Auch, Jeremy Wotherspoon and Kevin Overland. Roberts attended three Olympic games—Los Angeles, Calgary, Albertville—as part of the Canadian team and also provided support for athletes leading up to the games in Seoul, Barcelona and Lillehammer. During that time, she did research into biochemical markers of fatigue and specific adaptive responses to training. Robert’s PhD focussed on developing the altitude training program used by the speedskaters and swimmers from 1992-2000. “The timing was really good for me because sports science was a very young science so practically anything that I looked at was brand new,” Roberts says of her work in Calgary. With a young family in tow, Roberts moved to the Kootenays in 1998 to take a position teaching in the University Arts & Sciences Program at Selkirk College. In 2000, Roberts initiated a forest industry supported research project aimed at reducing injuries to tree planters. Following the athlete model she worked with for many years, the resulting Fit to Plant program has proven to reduce injuries by 40% and increase productivity by 12% for companies that implement it. Selkirk College instructor Dr. Delia Roberts came to the Kootenays in 1998. Following the completion of the Fit for Snow data collection after the 2010-2011 season, Roberts constructed a corrective program specific to the needs of the snow sport industry. Using the same five resorts, Roberts provided on-site training and made the Fit for Snow books available to a sample of employees. The result was a significant reduction in the number and severity of injuries with worker compensation claims dropping by 67% overall. Last season Whistler-Blackcomb signed up for the program specifically targeting a test group of 250 of its 1,500 ski instructors. Roberts brought a team of Selkirk graduates to help her provide workshops and training for the employees. This season the program is being used by Nelson’s Whitewater and Baldface Lodge, Great Canadian Heli-Skiing, Taos Ski Valley in New Mexico, and Schweitzer Mountain Resort in Idaho. On January 21-23, Roberts will travel to Steamboat, Colorado where she has been invited to speak at the National Ski Areas Association’s Western Winter Conference. Learn more about Fit for Snow and join us on Facebook.